Shop online for 57 g-factor plastic models at discounts up to 46%. This is the 1/32 Scale F4U Corsair White Bronze Landing Gear for a Trumpeter Model from G-Factor. This is the 1/32 Scale SBD Dauntless Brass Landing Gear for a Trumpeter Model from G-Factor. This is the 1/48 Scale F4 Phantom II Brass Landing Gear for a Hasegawa Model from G-Factor. 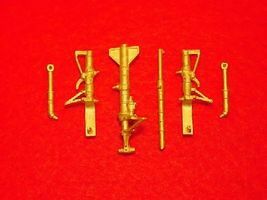 This is the 1/32 Scale He111 Brass Landing Gear for RVL Plastic Model Aircraft Accessory by G-Factor Models. This is the 1/32 Scale Spitfire Mk IX White Bronze Landing Gear for a Tamiya Model from G-Factor. This is the 1/48 Scale MiG31 Brass Landing Gear for AGK Plastic Model Aircraft Accessory by G-Factor Models. This is the 1/350 Scale HMS Hood Brass Propellers (4) for a Trumpeter Model from G-Factor. This is the 1/200 Scale British Nelson Brass Propellers for TSM Plastic Model Ship Accessory by G-Factor Models. This is the 1/72 Scale German U-Boat Type VII Brass Propellers (2) for a Revell Model From G-Factor. This is the 1/350 Scale USS Arleigh Burke Brass Propellers (2) for a Trumpeter and Dragon Model from G-Factor. This is the 1/32 Scale Gloster Meteor Brass Landing Gear for HKM Plastic Model Ship Accessory by G-Factor Models. This is the 1/350 Scale German Bismark Brass Propellers (2) for a Revell Model from G-Factor. 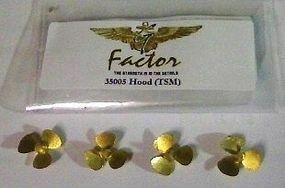 This is the 1/200 Scale USS Hornet Brass Propellers for Merit (4) Plastic Model Ship Accessory by G-Factor Models. This is the 1/144 Scale USS Fletcher Brass Propellers (2) for a Revell Model From G-Factor. This is the 1/350 Scale IJN Mogami Heavy Cruiser Brass Propellers (4) for a Tamiya Model from G-Factor. This is the 1/72 Scale Flower Class Corvette Brass Propeller for a Revell Model From G-Factor. This is the 1/48 Scale Saab Draken White Bronze Landing Gear for a Hasegawa Model from G-Factor. This is the 1/32 Scale F4U Corsair White Bronze Landing Gear for a Tamiya Model from G-Factor.